Food is processed for example for extending its shelf life and for adding flavour to the food. That is why oils, starch, fats, salt and sugar are added to processed food. Processed food contains a lot of additives and preservatives, but only very little nutrients. "Due to soil depletion, fruit, vegetables and plants contain considerably smaller amounts of important nutrients compared to many decades ago. The depletion has been so considerable that in order for us to get as much Vitamin C from oranges as our grandparents did in their time, we should eat eight oranges instead of just one." Dirt Poor: Have Fruits and Vegetables Become Less Nutritious?” A news item from the website Scientific American. Accessed 04.02.2018. A study carried out at the University of Texas researched the decrease in the nutrient content of 43 different vegetables and fruit during the period 1950 – 1999. The nutrient content had decreased by 6 – 38%, depending on the nutrient. The researchers drew parallels between these changes and factors caused by enhanced cultivation methods. J Am Coll Nutr. 2004 Dec;23(6):669-82. Changes in USDA food composition data for 43 garden crops, 1950 to 1999. Davis DR1, Epp MD, Riordan HD. Another analysis covering the years 1975 – 1997 showed that in case of 12 different vegetables, the calcium content had decreased by 27%, the iron content by 37%, the Vitamin A content by 21% and the Vitamin C content by 30%. Dirt Poor: Have Fruits and Vegetables Become Less Nutritious? A news item from the website Scientific American. Accessed 04.02.2018. In Great Britain, statistical records from 1930 – 1980 were analysed. The calcium content of 20 vegetables had decreased by an average of 19%, the iron content by 20% and the potassium content by 14%. There are about 422 million people with diabetes in the world. There are as many people who suffer from the symptoms of diabetes but who have not been diagnosed with diabetes. More than a billion people have high cholesterol. The key reasons for this are the low nutrient content of food, as well as the excessive use of sugar and fat. All processes in our body work as a result of cooperation between nutrients. That’s why we need a wide variety of nutrients. Even a small amount of vital nutrients can have a great significance on our well-being. For example, Vitamin D needs excipients to work. The key ones are magnesium, Vitamin K, zinc, boron and Vitamin A. Without a sufficient amount of excipients, Vitamin D is useless, no matter how much we ingest it. There are more than 8000 different types of antioxidants. They work in different parts of the cell, participating in various chemical reactions in our bodies. Read more. Some are our "first line of defence", stopping the formation of free radicals. Others guide them away before they can do any damage. Some antioxidants are involved in repairing the damage caused by free radicals. Berries, plants and fruit contain large amounts of different antioxidants. This strengthens our understanding that nature has designed nutrients to work together. Studies also support this assumption, indicating that antioxidants are stronger together. This kind of cooperation between antioxidants is referred to as antioxidant synergy in scientific literature. Source: Thorsteinn Loftssonm. 2014. Drug Stability for Pharmaceutical Scientists. Elsevier Inc.
WE NEED A VARIETY OF VITAL NUTRIENTS EVERY DAY. Our body cells renew constantly. In the body of an adult, 10 – 50 billion cells are renewed every second. We have the opportunity to influence the quality of the renewed cells – every day. Liver cells regenerate approximately every eight months. Bone cells regenerate approximately every ten years. Brains mainly consist of fats. More than 60% of our brains should be made from Omega 3 fatty acids. By eating good fats, you can affect your brain function already in just a few months’ time. Intestinal tract cells regenerate approximately every four weeks. Skin cells regenerate approximately every four weeks. Red blood cells regenerate approximately every three and a half months. We have been manufacturing high-quality well-being products already since 1997. 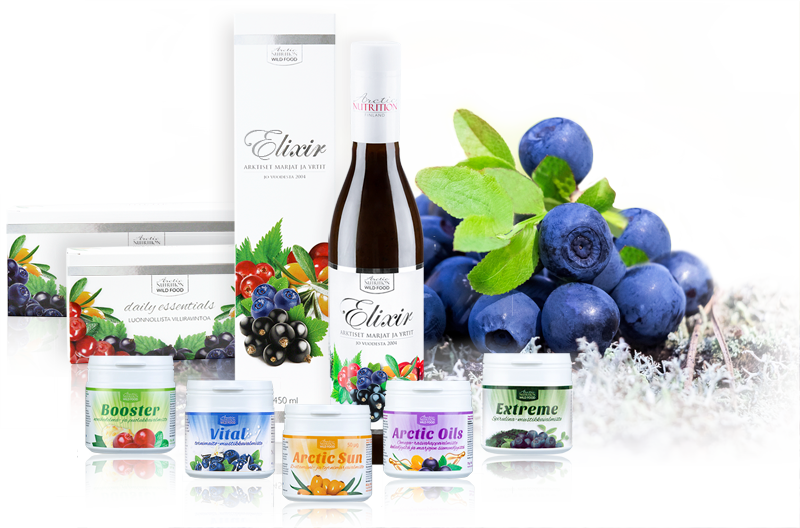 We use the best natural ingredients in our products, so that our quality requirements would be met. Our product development is based on a strong scientific foundation.